On the 12th Day of Fitness, your fitness challenge is . . . 12 holiday crunches, 11 alternate lunges, 10 tuck jumps, 9 chair dips, 8 squats, 7 mountain climbers, 6 push ups, 5 star jumps, 4 burpees, 3 minute bridge, 2 minute wall squat and a ONE MINUTE PLANK! The crunch is a great abdominal exercise that will round out our 12 day challenge. Pay special attention to your form as you perform the crunch, especially if you have a lower back or neck issue. 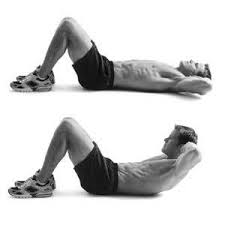 To perform a basic crunch, lie on your back with your knees bent and feet flat on the floor, hip-width apart. Place your hands at either side of your head or cross them on your chest. Tilt your chin slightly and curl up and forward so that your head, neck and shoulder blades lift off the floor. Hold at the top and then slowly lower back down to the floor. Repeat 12 times. This brings us to the end of our 12 Days of Fitness routine but we hope it is just the beginning of your holiday workout program! We challenge you to continue following this program throughout the holidays and to share it with a friend. We hope you have enjoyed this journey with us and will keep following our blog as we continue to offer you fitness tips throughout the New Year. We welcome your suggestions and feedback with regards to future topics. On behalf of the entire Lifestyles team, Happy Holidays and all the best in 2014!